It was very, very, extremely hard for the apostles to believe that the Lord Jesus Christ had risen. They considered the words of the Myrrhbearers who brought them this news to be lies. When they went to Galilee, to the mountain as Jesus had commanded them, and saw Him, some fell down and worshipped Him while others stood petrified and did not believe their own eyes. When Jesus appeared to all of them in the upper room in Jerusalem, they thought that they were seeing a spirit. 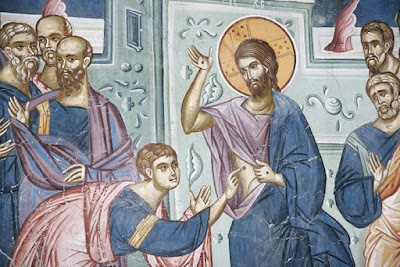 Strongest of all was the unbelief of the apostle Thomas, who had to place his fingers on the wounds from the nails on the Savior’s hands and feet and his hand on His side before he would believe. 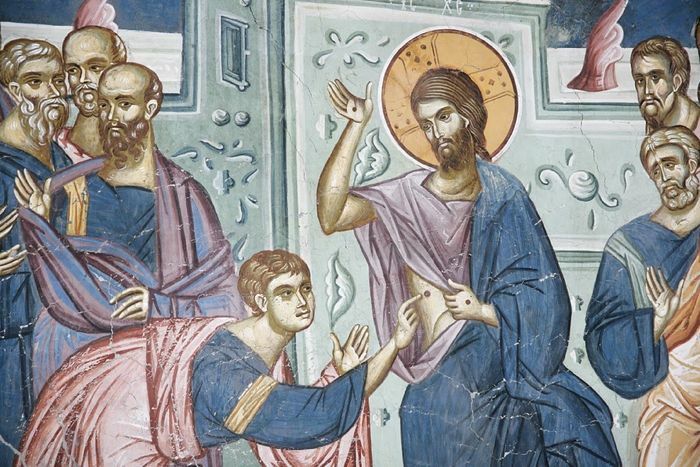 Why did the apostles believe even their own eyes with such difficulty? After all, they were witnesses to the Lord Jesus resurrecting the son of the widow of Nain, the daughter of Jairus, and even Lazarus, the four days dead. But after all, these were the acts of a very great Miracle Worker, and the dead did not resurrect of their own strength; but to believe in the possibility of a dead body coming back to life by itself, of its own power, was immeasurably more difficult. Thus, it was extremely difficult for Christ’s apostles to believe even what they saw with their own eyes. But for us who have seen neither the living nor the resurrected Jesus—is it harder or easier to believe what we read in the Gospels and in the writings of the holy apostles? Oh, of course it’s easier, much easier—for the great multitude of historical facts and events convince us beyond a doubt of the truth of Christ’s resurrection. What is there to say about the fact that the preaching of unlearned Galilean fishermen and their successors over the course of just a few centuries won over the entire inhabited world of the time—not only cultured Greeks and Romans, but even half-wild Germans, Galls, and Celts, and dealt a fatal blow to paganism? Could this have been possible if Christ had not risen? Wouldn’t have any preaching about the Crucified One as the Son of God been met everywhere only with mockery? Would it have been thinkable that tens of thousands of holy martyrs would have gone to horrifying tortures and terrible deaths if they did not believe in the Resurrection of Christ and were not on fire with love for the Conqueror of death? Would the hard ascetic labors of fasting and prayer of numberless anchorites and monks for the sake of knowing the Lord Jesus Christ and for the acquisition of the mind of Christ have been possible? Millions upon millions of people of all ages and sexes were true Christians, especially during the first fourteen centuries since the Birth of Christ. However, no matter how enormous was the power of preaching and the works of Christ, no matter how the Son of God’s death on the Cross and His Resurrection from the dead shook the world, not all believed in Him. Already among the Lord Jesus’s and His apostles’ contemporaries even the majority of God’s chosen Jewish race did not believe in Him. Unbelief, which has crashed like a huge wave over our modern nations of Europe and America, all formerly Christian, is ever growing and spreading. It began of course not during the Renaissance era of science and arts, not from Voltaire and the other Encyclopedists, but incomparably earlier, already during the first century after the Birth of Christ. What does this mean? It means that our Lord and God Jesus Christ does not forcibly draw people’s hearts to Himself, something He of course could do with His divine power, but looks for voluntary love and faith. Not every heart joyfully accepts His great commandments. Proud and domineering people laugh at the commandments of poverty of spirit, meekness, and mercy; they do not even think about God’s higher and eternal truth, they only want to hear about the rightness of social relationships, and they consider only proper relationships between nations to be the highest ideal. Do many want to be persecuted for righteousness sake, to be reviled and slandered for Christ’s sake? Do many enter through the straight gates by the narrow path, so that at the end of their difficult road they might hear the blessed call: "Come, ye blessed of my Father, inherit the kingdom prepared for you from the foundation of the world" (Matt. 24:34)? The apostle Paul speaks in his epistle to the Corinthians about the wise and prudent who have rejected faith in God for the sake of science: "For the preaching of the cross is to them that perish foolishness; but unto us which are saved it is the power of God. For it is written, I will destroy the wisdom of the wise, and will bring to nothing the understanding of the prudent. Where is the wise? where is the scribe? where is the disputer of this world? hath not God made foolish the wisdom of this world? For after that in the wisdom of God the world by wisdom knew not God, it pleased God by the foolishness of preaching to save them that believe. For the Jews require a sign, and the Greeks seek after wisdom: But we preach Christ crucified, unto the Jews a stumblingblock, and unto the Greeks foolishness; but unto them which are called, both Jews and Greeks, Christ the power of God, and the wisdom of God. Because the foolishness of God is wiser than men; and the weakness of God is stronger than men. For ye see your calling, brethren, how that not many wise men after the flesh, not many mighty, not many noble, are called: But God hath chosen the foolish things of the world to confound the wise; and God hath chosen the weak things of the world to confound the things which are mighty; and base things of the world, and things which are despised, hath God chosen, yea, and things which are not, to bring to nought things that are" (1 Cor. 18–28). Even during His earthly life, our Lord Jesus Christ called those who believe in Him His “little flock”. Do not be disturbed by this, but rejoice. And know that belonging to this flock throughout the ages and until the present day are very many quite important scientists, scholars, and philosophers, who were able to combine their belief in science with their higher faith in God and His Christ. And of those who reject religion based upon scientific data, the vast majority in fact have nothing to do with science and talk about it only on hearsay. And for you, simple, unlearned people, let the words of Christ be a strong support: "Except ye be converted, and become as little children, ye shall not enter into the kingdom of heaven" (Matt. 18:3).